A new report finds little oversight in how the money is being spent. 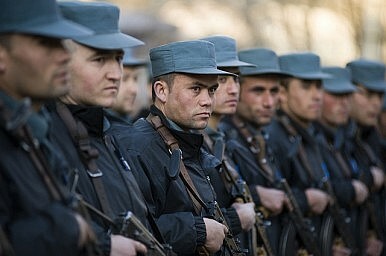 Yesterday, the office of the Special Inspector General for Afghanistan Reconstruction (SIGAR) released an alarming report stating that a large portion of the more than $300 million in annual U.S. funding for Afghan National Police (ANP) salaries is in danger of being wasted or abused. Poor oversight over data collection processes and missing reporting mechanisms are cited as the main reasons behind this development. The report also emphasizes that with coalition forces gradually withdrawing from large portions of Afghanistan, this problem will get worse. As I pointed out here, long-term external support for the Afghan Police force (numbering around 150,000 police officers) is critical to the success of Afghan government forces against the Taliban. Since 2002, the U.S. government has provided more than $15 billion in funding to train, equip, and sustain the ANP of which $1.3 billion directly went into paying the salaries of the policemen. However, the SIGAR report notes that since 2006, U.S. government audit agencies have consistently found problems with the tracking and reporting of Afghan National Police (ANP) personnel and payroll data. Previous reports have disclosed inflated police rosters, payments being made to more police personnel than are authorized in particular locations, and police personnel receiving inflated salaries. One of the reasons for this is that even after nine years of effort, an electronic human resources system has still not been successfully implemented. And although an electronic payment system is operational in 25 of Afghanistan’s 34 provinces, lack of internet connectivity prohibited nine provincial headquarters, responsible for 51 percent of all Afghan National Police personnel, from entering data on time. “These delays and inconsistencies can prevent UNDP from analyzing data for over half of the ANP’s personnel until months after salary payments are made,” the report notes. All data on the ANP is collated at the Ministry of Interior in Kabul and then passed on to United Nations Development Program (UNDP) officials, who act as program watchdogs. The report partially blames the United States, NATO, and the United Nations for their inability to implement stronger oversight mechanisms over the last few years. For example, U.S. officials confirmed that over the past year they accepted, without question, all personnel totals provided by the Afghan Ministry of Interior (MOI). Additionally the report points out that, 20 percent of ANP personnel are at risk of not receiving their full salaries because they are paid in cash by MOI-appointed trusted agents, who might pocket as much as half of the payments. According to the Washington Post, the head of the Combined Security Transition Command-Afghanistan, Maj. Gen. Todd Semonite, aims to implement a fully functional electronic accounting and personnel tracking system by January 2016. The Pentagon doesn't know how well its advisors are advising in part because it keeps moving the goalposts.